Bancaixa-BSC : Aplicación de la computación cognitiva a la innovación financiera (2016- ). COMPOSE (Collaborative Open Market to Place Objects at your Service) (2012-2015). COMPOSE is a FP7-ICT-2011.1.2 (ref. 317862) EU Funded Project, coordinated by IBM Haifa (IL) with the following partners: CREATE-NET (IT), Fraunhofer Institute FOKUS (DE), The Open University (UK), Barcelona Supercomputing Center (ES), INNOVA S.p.A (IT), University of Passau (DE), U-Hopper (IT), GEIE ERCIM (W3C) (FR), Fundació Privada Barcelona Digital Centre Tecnològic (Bdigital) (ES), Abertis Telecom (ES), and EVRYTHNG (CH). COMPOSE aims at enabling new services that can seamlessly integrate real and virtual worlds through the convergence of the Internet of Services (IoS) with the Internet of Things (IoT). COMPOSE will achieve this through the provisioning of an open and scalable marketplace infrastructure, in which smart objects are associated to services that can be combined, managed, and integrated in a standardised way to easily and quickly build innovative applications. BSC – IBM BGAS SoW (2013-2016) is a joint research project between researchers at Barcelona Supercomputing Center (BSC) and the “Scalable Data Centric Computing” group at IBM Research – Watson Lab. This project aims at exploring systems and software strategies for leveraging in-memory key/value databases to accelerate data intensive tasks, with particular attention to the IBM BlueGene Active Storage (BGAS) architecture and the Scalable Key/value Store (SKV) as the key/value store. BSC – IBM Heterogeneous Clouds SoW (2013-2016) is a joint research project between researchers at Barcelona Supercomputing Center (BSC) and the “Middleware and Virtualization Management” group at IBM Research – Watson Lab. This is a project focused on building clouds which via their programmability at multiple layers and the embracing of hardware heterogeneity can host a variety workloads and can optimize resource configuration for these workloads. The project will explore the applicability of the so-called “Software Defined Environments (SDE)” to HPC workloads as it has been previously done with transactional and data analytics workloads. Aloja (2014-2016) ALOJA is project funded by Microsoft Research through the BSC- Microsoft Research Center (bscmsrc.eu) that aims to provide automated optimization to Hadoop’s performance under different hardware deployments options and software parameters. We are also exploring new hardware architectures, both on-premise or in the cloud (either IaaS or PaaS) and what is the best configuration option for a given Hadoop job (or job type). Part of the project includes a public (vendor neutral) Web platform with a repository of Hadoop benchmarks and data analysis tool. We currently have over 4500 Hadoop benchmark executions both from our local clusters as well as in Azure (IaaS), on which we base our research. Severo Ochoa Distinction(January 2012- January 2016): The Barcelona-Supercomputing Center-Centro Nacional de Supercomputación (BSC-CNS) has been accredited as Severo Ochoa Centre of Excellence, the award with which the Spanish Ministry recognizes leading research centres in Spain and international reference organisations in their respective areas. The award will enable the execution of an ambitious research project which involves designing the hardware, software and applications to provide future solutions to the social challenges arising in health and climate change. Our contribution: provide the applications with resource management strategies according to their data management requirements and contribute to the design and development of an integrated stack of software to support the execution of the applications. NUBA project (Normalized Usage of Business-oriented Architectures) (2009-2012). NUBA is a strategic research program (MITyC TSI-020301-2009-30) funded by the Avanza2 R&D Plan of the Spanish Ministry of Industry, Tourism and Trade and coordinated by Telefonica I+D with 8 partners. The aim of NUBA is to advance the state-of-the-art in business models and technology for the real-time deployment of federated Cloud platforms, integrating infrastructure from different providers, to execute elastic business services with the required QoS and minimizing the energy consumption. http://nuba.morfeo-project.org. OPTIMIS project “Optimized Infrastructure Services” (2010-2012). European Union funded project. The project focuses on open, scalable and dependable service platforms and architectures that allow flexible and dynamic provision of advanced services with the goal of satisfying key societal and economical needs. The OPTIMIS innovations can be summarized as a combination of technologies to create a dependable ecosystem of providers and consumers that will be the foundation of an efficacious operation of services and infrastructures. OPTIMIS provides a revolutionizing foundation for a reliable,auditable, sustainable, and trustful cloud market for a smart planet. VENUS-C: (2010-2012). European Union funded project. The project will develop and deploy a Cloud Computing service for research and industry communities in Europe by offering an industrial-quality service-oriented platform based on virtualisation technologies. IBM project “Performance Management of Data-Analytic Programming Models in Cloud Environments” (2010-2011). The project will focus on the expansion of large scale data analytics and management challenges posed by the mix of heterogeneous applications in the scope of hybrid data centers. BG/ASF joint research project (BSC – IBM) with the Scalable Data-centric Computing department at IBM TJ Watson research lab (Yorktown, NY). Active Storage Fabrics (ASF) is a collection of components that surround a parallel in-memory database (PIMD). PIMD is a parallel client, parallel server, key/value object store. This research is part of the MareIncognito research framework between IBM and BSC. Member of the Management Committee of EU COST IC804 action “Energy efficiency in large scale distributed systems”. (2009-2012). This action aims to foster original research initiatives addressing energy awareness/savings in the field of energy efficiency in distributed systems. LAgrid network: Adaptive Systems for heterogeneous containers and workloads. an international multi-disciplinary research community and virtual computing grid enabling institutions and industry to extend beyond their individual reach to facilitate collaborative IT research, education and workforce development. (2006-2009). SOW ADAPTSYS: Adaptive Systems with IBM (T.J. Watson Labs, NY) (2006-2008). In this project we are introducing adaptability techniques into application servers hosted in shared data centers ( Up to tens of thousands nodes with applications sharing nodes) that are managing hetero heterogeneous environment workloads and containers (2006-2009). BREIN project: Business objective driven REliable and Intelligent Grids for real BusiNess. Integrated Project for FP6-2005-IST-5 IP. Our grup participate in the adaptive resorce management part. European partners: Telefónica Investigación y Desarrollo, Höchstleistungsrechenzentrum der Universität Stuttgart HLRS, University of Manchester, ADEI Consultoria S.L., Flughafen Stuttgart GmbH ,ANSYS ,BOC Asset Management ,Barcelona Supercomputing Center , Centro di Ricerca in Matematica Pura ed Applicata, DATAMAT S.p.A., IT Innovation Centre, Poznan Supercomputing and Networking Center, University of Hohenheim. (2006-2009). XtreemOS project: Building and Promoting a Linux-based Operating System to Support Virtual Organizations for Next Generation Grids. Integrated Project for FP6-2005-IST-5 IP. Our group is in charge of the porting the eBusiness applications. European partners: Caisse des Dépôts et Consignation, Institut National de Recherche en Informatique et en Automatique, Council for the Central Laboratory of the Research Councils, Consiglio Nazionale delle Ricerche, European Aeronautic Defence and Space Company, Electricité de France, Edge-IT, NEC High Performance Computing, Europe GmbH, SAP, Barcelona Supercomputing Center, Universität Ulm, Vrije Universiteit Amsterdam, XLAB, Konrad-Zuse-Zentrum für Informationstechnik Berlin, T6 Italy, Institute of Computing Technology of Chinese, Academy of Sciences, Red Flag Software, Telefónica I+D, Heinrich-Heine Universität Düsseldorf . (2006-2010). Network of excellence CoreGrid: European Research Network on Foundations, Software Infrastructures and Applications for large scale distributed, GRID and Peer-to-Peer Technologies. Network of Excellence” (NoE) del 6th Framework Program. Our group only works in the area of Autonomic Computing. 42 EU partners involved. (2005-2009). “Explotación del Paralelismo en Arquitecturas de Alta Velocidad”(CICYT) TIC-299/89. (1990 – 1992). “Arquitectura y Compilación para Supercomputadores”(CICYT) TIC-0880/92 (1992 -1995). “Computación de Altas Prestaciones” (CICYT) TIC-95-429 (1995-1998). “Acción Integrada Hispano-Britanica 1995-1996: Distribución Automática de Datos para Computadores de Altas Prestaciones”. 163 B.
Computación de Altas Prestaciones II” (CICYT) TIC-98-511 (1998-2001). “Computación de Altas Prestaciones III” (CICYT) TIC2001-0995. (2001-2004). “Grup de recerca de Qualitat” CIRIT GRQ95-00402 (1995-1997). “Grup de recerca de Qualitat” CIRIT 1997 SGR-00005 (1997-1999). “Grup de recerca de Qualitat” CIRIT 1999 SGR-00128(1999-2001). “CAP-BASIC”.PROFIT- FIT-070000-2001-190. with IBM (2001-2003). “Computación de Altas Prestaciones IV: Arquitecturas, Compiladores, Sistemas Operativos, Herramientas y Aplicaciones” TIN2004-07739-C02-01 (2005-2007). “Computación de Altas Prestaciones V:” con el contrato TIN2007-60625 (2007- 2012). “Computación de Altas Prestaciones VI” con el contrato TIN2012-34557, del ministerio de Economía y Competitividad(2013- *). Grupo de investigación consolidado 2009SGR-1027 de la Generalitat de Catalunya (2009-2014). 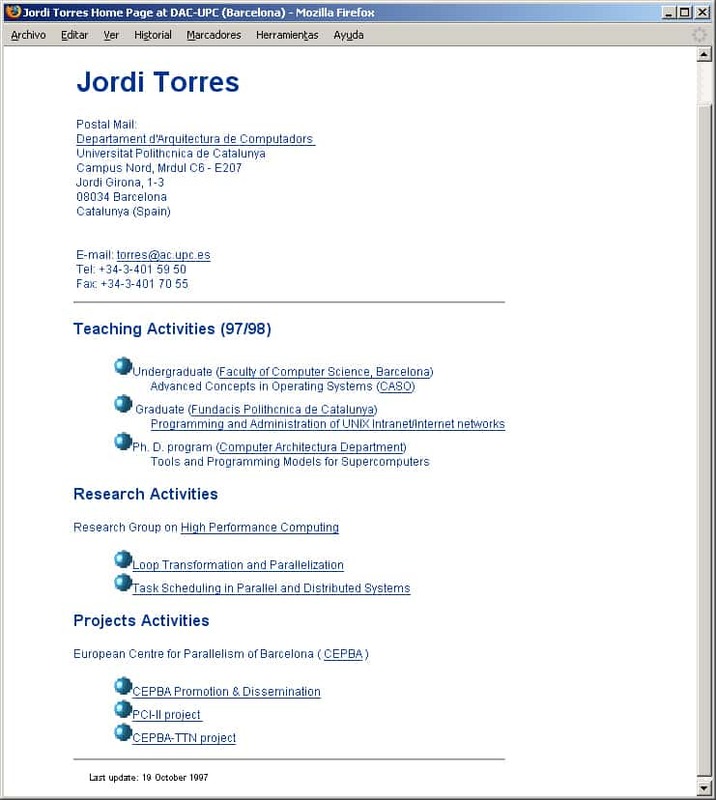 Spanish Research Grant “Computación de Altas Prestaciones VI” under contract TIN2012-34557, from Spanish goverment (2013- 2017). Catalan Research Grant 2014-SGR-1051 de grup de recerca consolidat (2014-2018). “Automatic Data Distribution for the CONVEX MPP”. Convex Computer Corporation (1993-1995). “Performance-Critical Applications of Parallel Architectures”. Esprit BRA 6634 (1992 -1995). “PERMPAR” .UPC, CESCA, INTES, IRCN, Bureau Veritas. ESPRIT (1994-1995). “PARMAT” Efficient Handling of Large Matrices on High Parallel Computer Systems in the PERMAS Code ESPRIT. Partners: INTES Ingenieurgesellschaft für Technische Software mbH (GE), CEPBA-UPC (ES), Institut de Recherches de la Construction Navale (FR), Bureau Veritas (FR), Structural Engineering (Norway), Dinalis (FR). (1997-1998).